Darren came to the practice after recently suffering from a stroke. 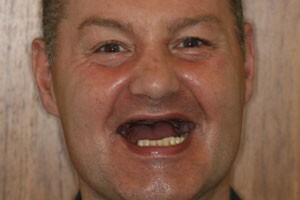 Darren’s teeth had been failing for many years, he had already lost all his upper teeth and a few lower teeth. Darren wanted to look better especially after his near-death experience and also be able to eat properly. Darren is a chef and runs events company with his partner. 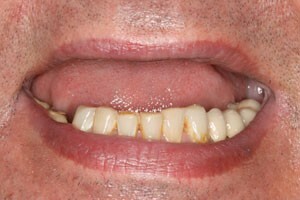 We placed six dental implants in his upper jaw and one in his lower jaw. 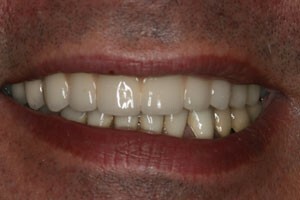 He had an upper full mouth implant bespoke bridge and in the lower jaw a combination of veneers, crowns and an implant crown. Our aim was to build up his bite and improve his smile. 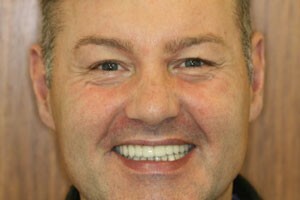 Darren’s results were so great he has been featured in the national press.